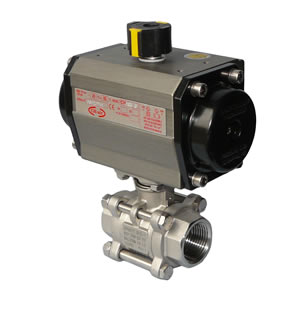 Air actuated stainless steel ball valves with NPT ends fitted with the CH-air actuator produces a rugged and reliable actuated valve suitable for a wide range of applications. Commonly used in water, steam, food and a wide range of chemical duties. AVS assemble and test all actuated valves prior to shipping so you buy with confidence. AVS are a ISO9001-2015 certified company.